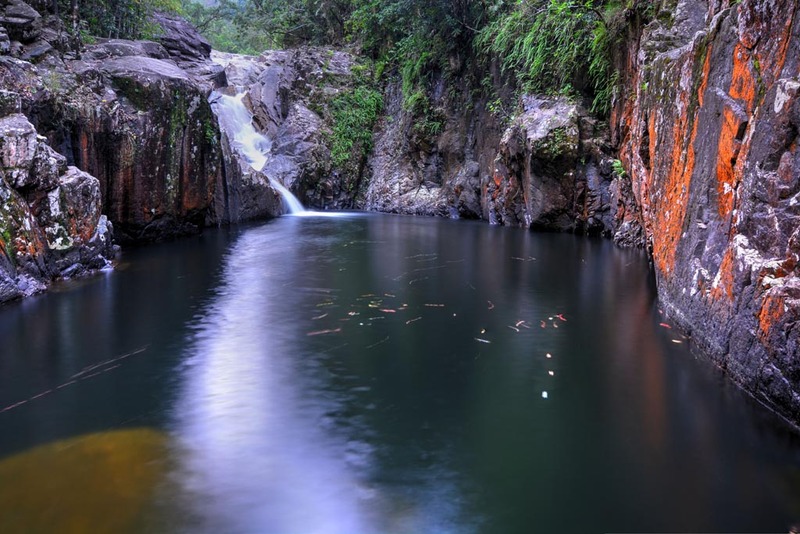 Eungella National Park is a 90-minute drive west of Mackay, Queensland. 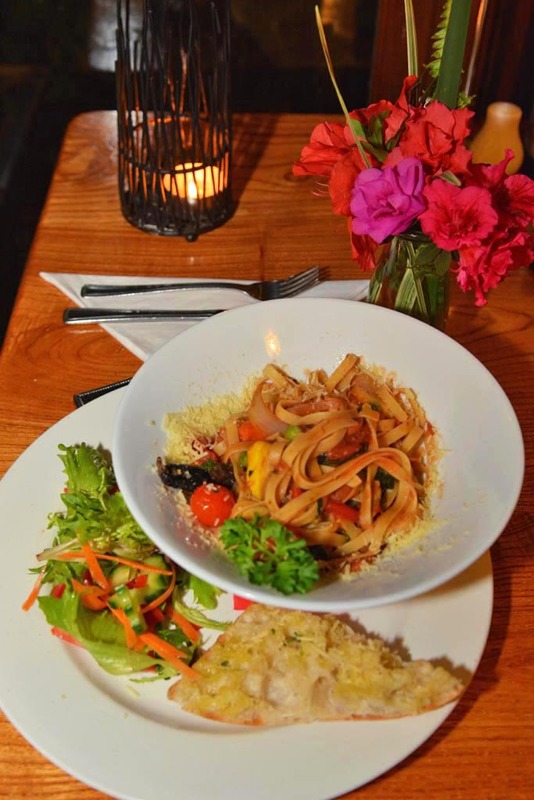 The drive is through the picturesque Pioneer Valley and along a winding road up the mountain range to the little township of Eungella, which is Aboriginal for “Land in the Clouds”. Here we hope to spot the iconic Eungella Platypus as it’s one of the best places in Australia to spot them. The platypus is an iconic symbol of Australia. In the mountains and made up of tropical rainforest the national park is one of Australia’s most ecologically diverse parks. With its highest elevation of 1259 metres at Mt Dalrymple and the Eungella township 735 metres, it is often cold and shrouded in mist. It’s home to an abundance of native wildlife, many endemic to the area including the Eungella gastric brooding frog and the Eungella honeyeater. 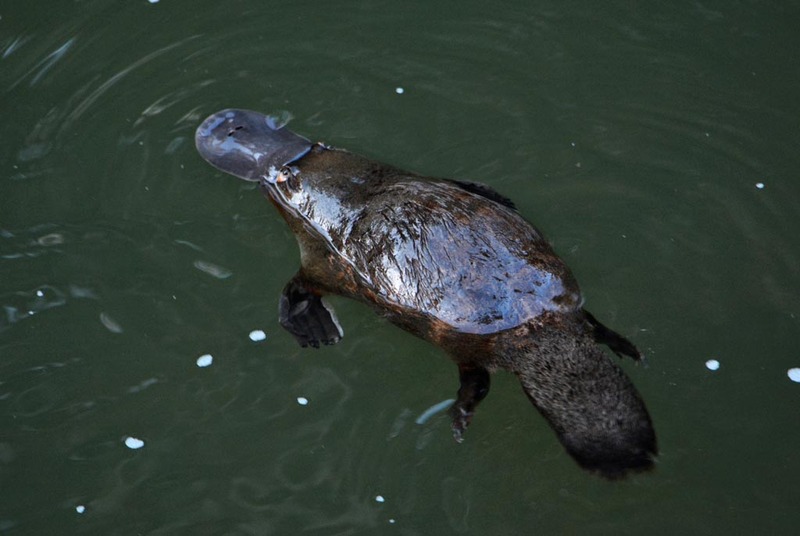 Endemic to Australia, the platypus is also one of these species which call Broken River in Eungella home. 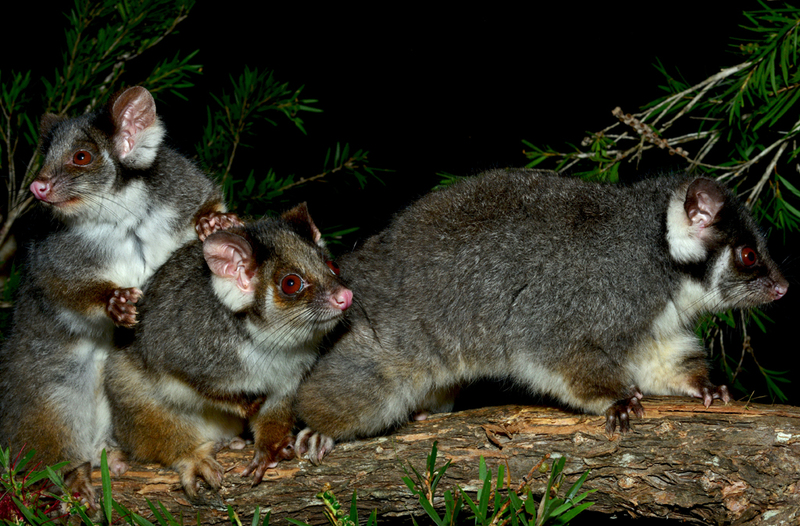 Eungella is home to an abundance of wildlife, such as these cute Ringtail Possums. On our first morning, we are on the viewing platform by 6 am and the only ones here. It is freezing cold and mist dances on the river’s surface. The platform overlooks the platypus pool, and towering palms, fern trees, and flourishing tropical vegetation of the rainforest surround us. The beautiful musical singing of the honeyeaters and laughing kookaburras welcome the first light. The large still tranquil pools that run into sparkling cascading pools and meander through the rainforest are the platypus’s hunting ground. Platypus are notorious for being almost impossible to spot in the wild. Cute little turtles bop on the surface waiting for food and after about 15 minutes bubbles appear on the surface and then, sure enough, our first platypus! We are in awe of this little critter with his duck-like beak and little brown eyes that make direct eye contact. He is so close that he hears the camera shutter and darts back underwater. About 5 minutes later he reappears and stays on the surface for about 30 seconds before diving back under and repeats this several times. 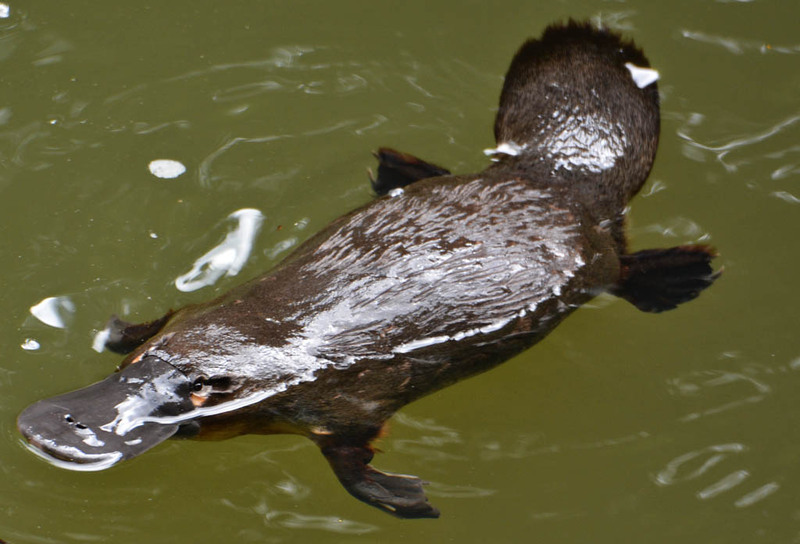 Platypus chews and swallows their food on the surface, so we think he has found a food source. Once he disappears another two platypus show up so definitely a good food supply here! They have two layers of fur which traps the air to keep them dry underwater. This causes the silvery sheen. Shy, elusive, easily frightened, and creatures of dawn and dusk; the platypus is notorious for being nearly impossible to spot in the wild. They shelter in burrows, and the only opportunity to see them is during a small window of time when they are hunting for shrimp, yabbies, worms and other little invertebrates.We are pleased to say that sightings are almost guaranteed here; however photographing them is not so easy as they are so quick! During our two days, we see them every morning and afternoon and we spot their secret den. We see their bubbles as they leave and return to their den under overhanging bushes on the river’s edge. Platypus are very suspicious and watchful. They dive for food and only resurface to breathe and digest their food and this is the only opportunity of photographing them. To make it even harder, they are so small, only about 40 – 50 cm long and they blend in with the water. They are very watchful and nervous. When they surface they see us no matter how good we hide. We need to be quick to photograph them! 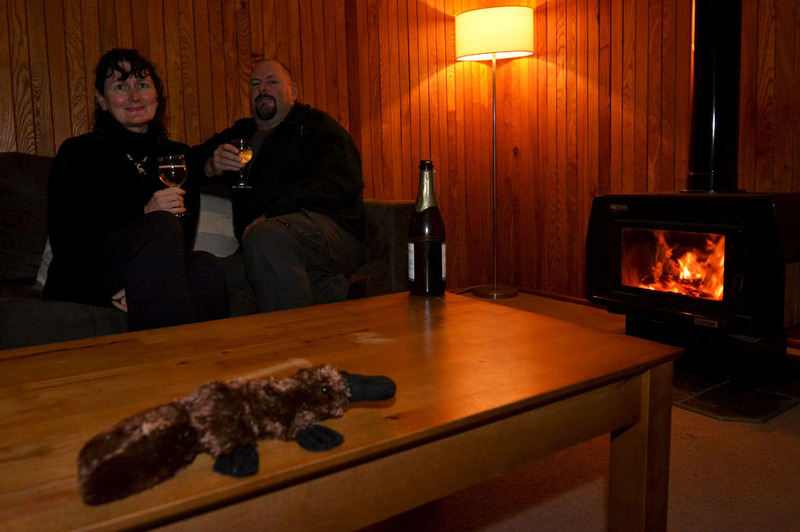 We stay at Broken River Mountain Resort situated on the bank of Broken River and it is the place to stay for ultimate access to the platypus. It is only a few minutes’ walk to the platypus viewing platforms and is surrounded by wildlife such as flocks of the raucous sulphur crested cockatoos and brushtail possums. We love our cosy room. The cool rainforest is a different world compared to the tropical heat left behind hundreds of metres below and during winter, the temperature can go down to freezing. This adds to the atmosphere. We love the log fire burner in our cosy self-contained room. The accommodation is simple but sparkly clean and fresh. We stay in the Cedar Lodge which is $105 a night during their Spring Special which was 50% off. It has a bedroom with a queen-size bed, bathroom, kitchen and utensils and a little lounge room with TV and a log fire burner. There are different styles of accommodation to choose from at the resort. Though the rooms are self-contained we recommend eating at the resort’s Possums Table Restaurant for at least one night. The food is a little expensive but very nice and the ambience is gorgeous and warm with the log fire burning. 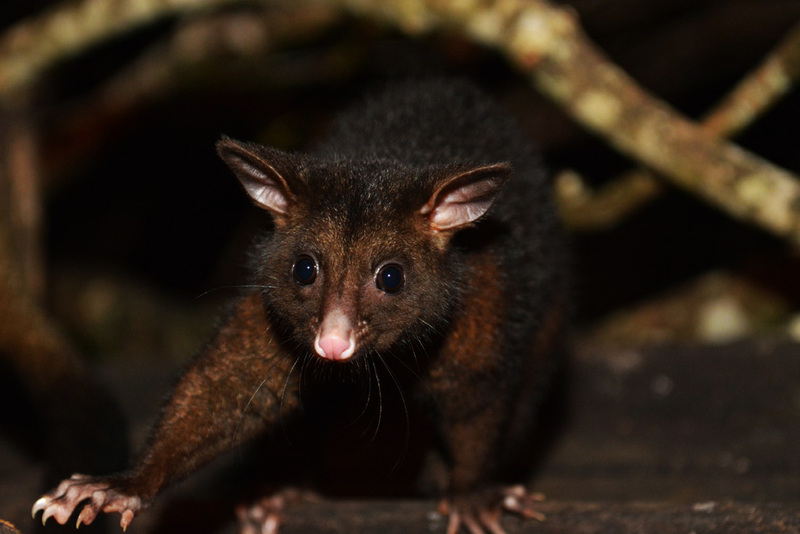 There is also an outside deck that overlooks the rainforest where the possums come in hoping for a special treat from the chef. Whether it’s for a quiet and relaxing time in the fresh cool mountain air, a romantic getaway, spotting the wildlife, or taking advantage of the beautiful walks in the rainforest, Eungella is a unique getaway in the Whitsunday hinterlands. 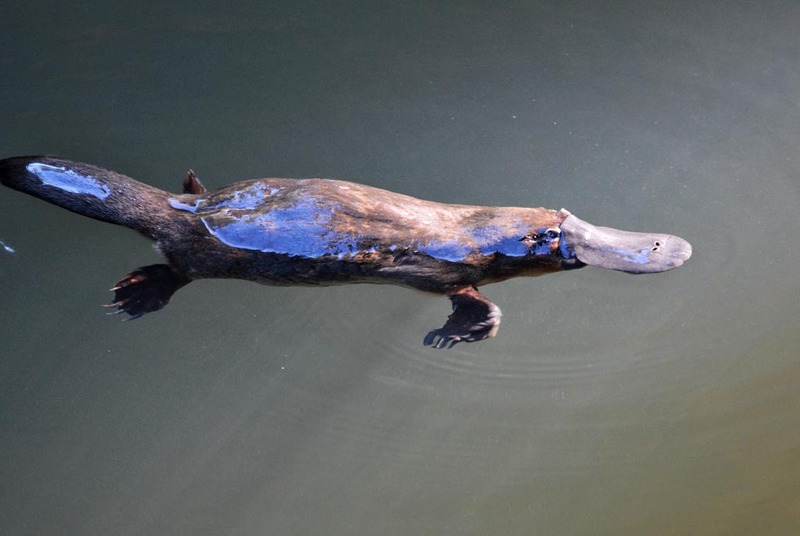 The Eungella Platypus would have to be one of the most “used to people” platypus in Australia and one of the best places to see them in the wild. Eungella is one of the best places to see platypus in the wild. The platypus is best seen in the early morning and late afternoon. We were at the viewing platforms about 6 am to 8 am and 4 pm to 6 pm. They don’t like the sun and stay in the shaded areas of the creek outside of these times. They love swimming and hunting on overcast days. Avoid making too much noise and quick movements. Platypus are very alert and perceptive. No matter how quiet and still we are they always spot us! Even the click of a shutter can make them dive very quickly back underwater. A lot of patience is necessary for photographing platypus. If you don’t see them right away don’t give up! 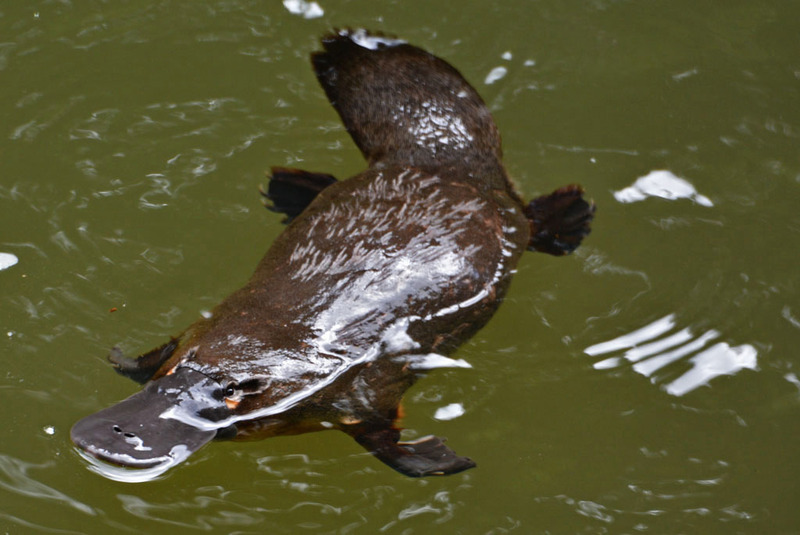 Platypus can hold their breath for 10 minutes so it can take this long for them to surface. Be prepared! When they surface it is only for a short time. When they go to the bottom of the river hunting for food they release bubbles and sometimes a trail of mud from the bottom of the river. Concentric circles also can appear on the surface just before the platypus does. The Eungella Platypus can be seen all year. Winter is the best time as the babies are emerging from their nests. The bigger the lens the better for the platypus. Our images are taken with a 300mm lens. Remember to blend into the environment. Don’t wear bright or fluorescent clothing. Great walking tracks meander through the rainforest ranging from 1–8 km long. Most are in the shelter of the rainforest, so they are not too hot anytime of the day. For some of the longer one-way walks, the staff at the resort will drop guests off at the start of the walking track so they can walk back. Eungella is also the start of the 56 km Mackay Highlands Great Walk. 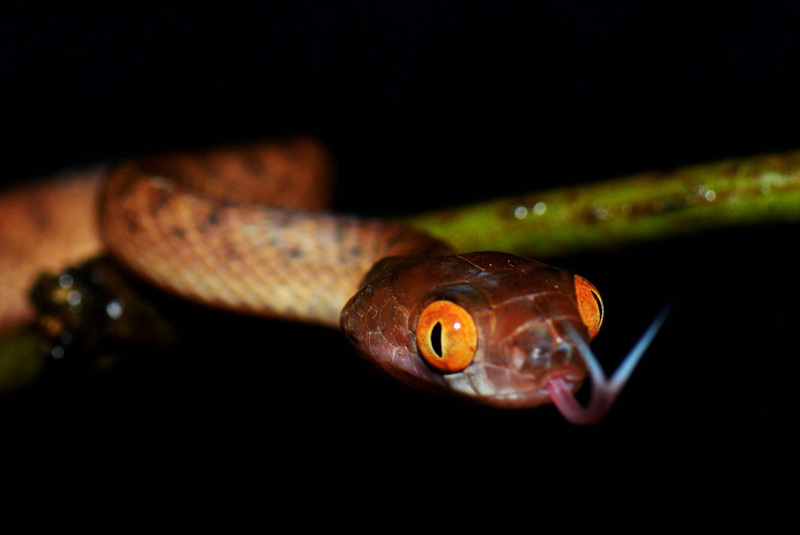 Spotlighting tours for wildlife in the rainforest can also be arranged at the resort. 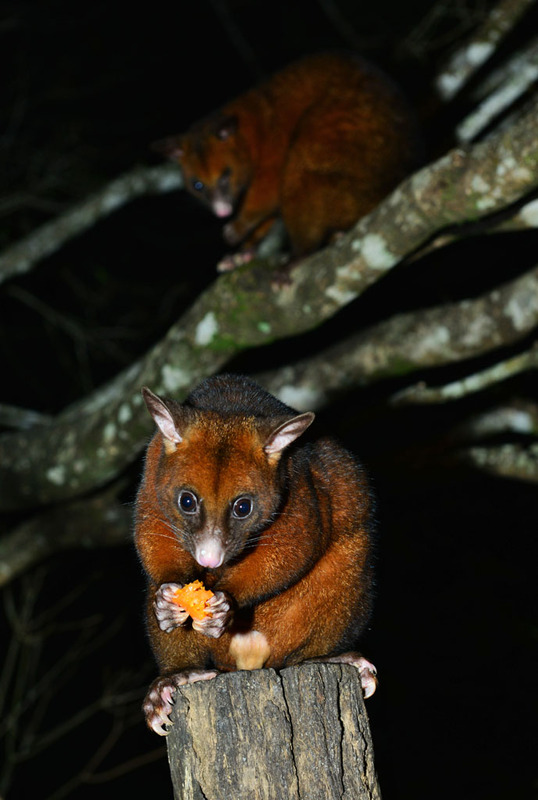 Brushtail possums, greater gliders, sugar gliders, tawny frogmouths and red-eyed tree frogs are some of the possible sightings. 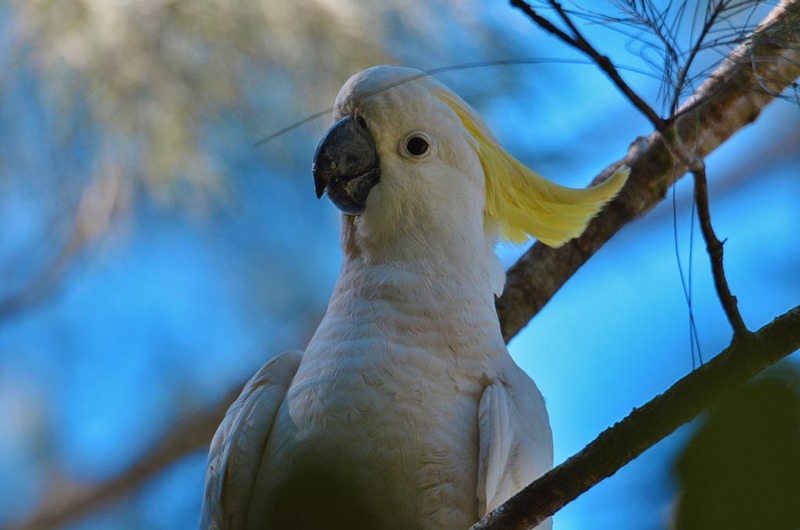 Cockatoos, kingfishers, rainbow lorikeets and honeyeaters are some of the birds to see while bird watching during the day. Download the “Welcome to Eungella” visitor guide. Because of the altitude, it can get down to 0°C in winter. We were there in early September and it was still freezing! In summer the temperature is still considerable cooler than the coast, especially the nights. More information on Broken River Resort. There are two camping sites in Eungella National Park which have close access to viewing the Platypus. Fern Flats Camp – A beautiful bush camp on the banks of Broken River about 600 metres in the rainforest. Broken River Bush Camp – Across the road from Broken River Resort, on the rivers edge and close to the platypus viewing platforms. You may spot the platypus from your camp! About 30 km back down the mountain, in the lowlands of Pioneer Valley is the little town of Finch Hatton. From here Finch Hatton Gorge is about another 20 km. Still a part of the Eungella National Park the area is also home to many birds and wildlife, and the platypus live in the creeks here too. The gorge has swimming holes, waterfalls, volcanic boulders, crystal clear swimming holes, and lush rainforest.Tropical rainforest trails lead to pretty swimming holes and waterfalls. Araluen Falls in 1.6 km one way and further on the Wheels of Fire Falls is 2.1 km one way. At Rainforest Dive, there is an opportunity to dive in the freshwater of the rainforest with turtles, fish and eels. There is a small chance of seeing the platypus while diving. Famous pies at Pinnacle Pub. Here we have vegetable pies with the lot – peas, chips and gravy. Further on, about 10 km from Finch Hatton enjoy a cold drink and a meal on the deck of the Pinnacle Pub. 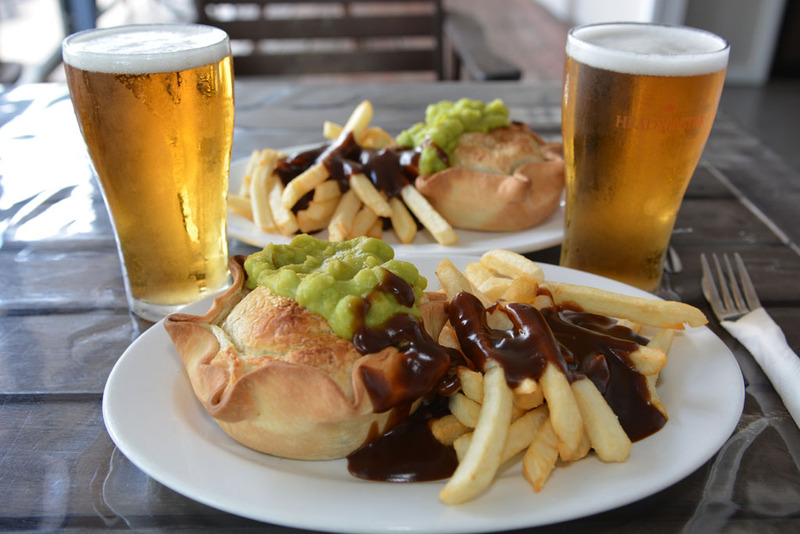 Made famous by their scrumptious home-made pies, this great little Aussie pub serves them all day. There is every filling imaginable including vegetable ones, and the apple pies are delectable! Broken River in Eungella is a haven for Platypus. When visiting the Mackay region it is a good idea to stay at least for a few days. In Eungella we suggest a stay of a minimum of two days to give the best chance of spotting the platypus. In the area and about 100 km away is Cape Hillsborough renowned for the kangaroos on the beach at sunrise. Only you two could do a blog about the Platypus! This is adorable Ray & Sue. Eungella looks like heaven & a stay at Broken River Resort is definatley on my list! Thanks Laila. Broken River is a beautiful place to spend a couple of days. You will also have a great chance of seeing the Platypus! Wow once again an amazing blog. You have turned something that’s not so photogenic into a great article with your awesome images of this Australian icon. Hi Shelby. We thought we would be very lucky to see them, but didn’t realise just how hard they are to photograph! They are well worth just seeing in the wild though. Thanks for reading our blogs & your comments. Wonderful! Love the fireplace. You showcase our local environs so well it reminds the jaded eye that we take for granted that which is amazing, right here in Oz! Such a cosy, romantic little getaway, so available. Ideal to cool off in the hot summer months. I’ll be heading there. The photography is exquisite. Thankyou for the rare glimpse of our shyer native fauna. (Though not surprised you two got them to smile for the camera). Magic! Hi Gypsy. 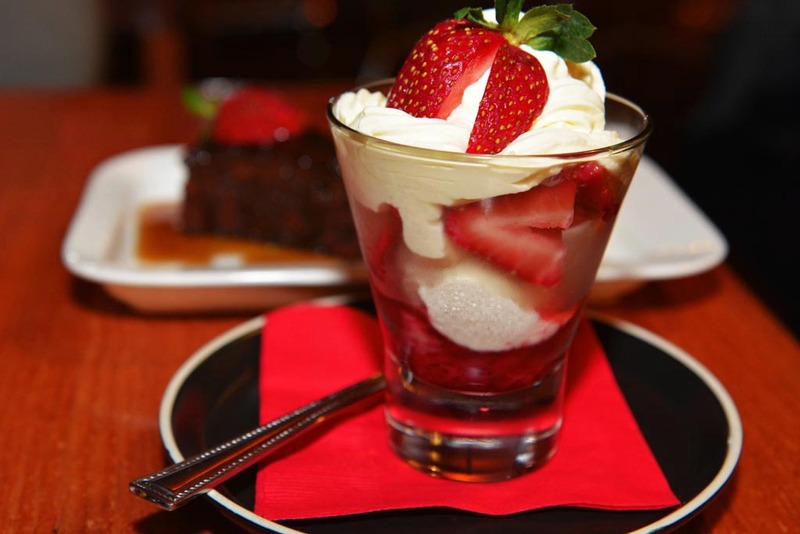 Eungella is a great place for a romantic getaway. The weather is just beautiful and even cool during summer. Thanks for reading our blogs and your comments. We always look forward to reading them! Hi Steve & Louis. We think this is normal, as the Platypus have to swim past when they come & go from their den. You just need to be quick and patient! We imagine if you stayed up there for a couple of weeks, you would get some great images. Thanks for visiting our website and your comments. You have been rewarded for your patience. And your love of all creatures shows through the photos you take. Like the comments on the places that you stay at makes you want to visit. Thanks Noela.Fortunately we didn’t have to wait for too long! Eungella is a great place to spot the Platypus and you have a very good chance of seeing them if you stay for a couple of days. 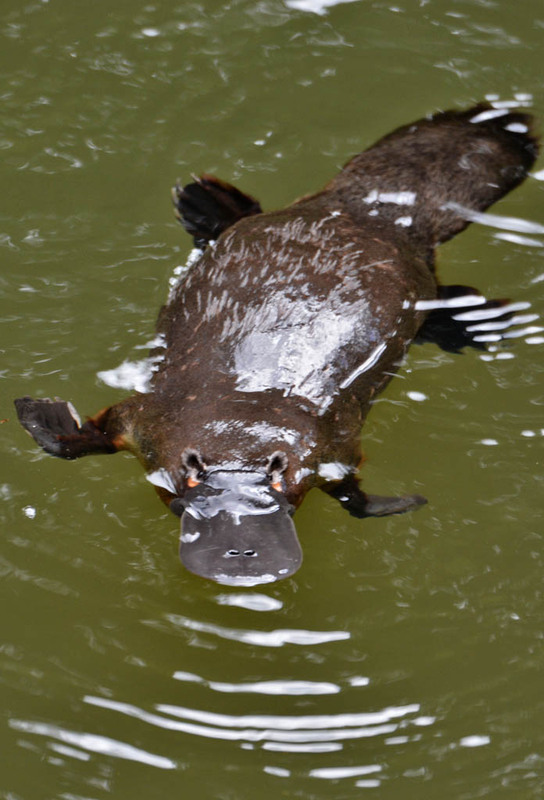 Great information on the surrounding area and platypus. Will definitely be putting this spot on my to go to list. Are you able to provide any more details in relation to the new Broken River Bush camp? Are there any facilities like a toilet block etc? Thanks Vicky. Hi Vicky. Thanks for your comment. The bush camp has no amenities, but there are toilet facilities, drinking water, picnic tables and gas BBQS about 200 metres away. The bush camp is just across from the Broken River Resort and is on the river’s edge. You will see the Platypus for sure from here, as their nest is close by. The official viewing platforms are also just a couple of minutes’ walk away. You can drive your vehicle into the camp & park right beside your tent. 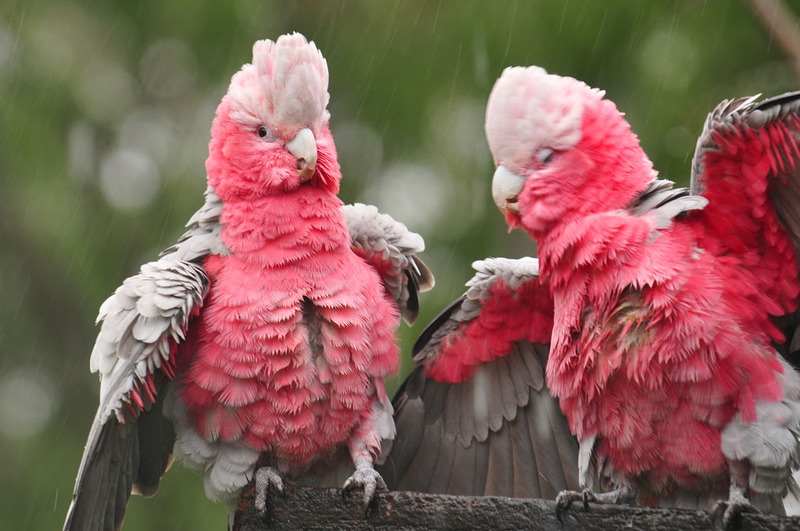 It is very pretty & in the afternoons flocks of Cockatoos usually come in & drink from the river. It is a nice alternative to staying in the resort, but if you go in winter be prepared for the cold! This is one cool critter that I would love to click one day. It would be awesome to see this. Love your site and all your tips for photographers. Keep up the great work and best of luck for the future. He sure is an awesome critter Karan! It was great to see these in the wild so close-up as they are such an elusive and shy animal. Thanks for your comments.